Escalante (/ɛskəˈlɑːnteɪ/, local /ˈɛskɛlæni/ or /ˈɛskəlænt/) is a city in Garfield County, Utah, United States located along Utah Scenic Byway 12 (SR-12) in the south central part of the state. As of the 2010 census, there were 797 people residing in the city. The city is named after Silvestre Vélez de Escalante, a Franciscan missionary and a member of the first European expedition into southern Utah. The nearest towns are Boulder which is 27 miles (43 km) to the northeast on SR-12, and Henrieville which is 30 miles (48 km) to the southwest on SR-12. The Escalante Petrified Forest State Park is located to the west of the city. Sections of the Grand Staircase-Escalante National Monument (GSENM) abut much of the city's limits. The Hole-in-the-Rock Road, which begins 5 mi (8.0 km) east of Escalante, is the main access road into the eastern section of GSENM. The road leads to the Canyons of the Escalante, the Devil's Garden and the Hole-in-the-Rock. In 1776, Silvestre Vélez de Escalante and Francisco Atanasio Domínguez left Santa Fe, New Mexico attempting to find a route to the missions of California. The Dominguez–Escalante Expedition followed a route north through western Colorado, west across central Utah and then southwest through what is now called the Escalante Desert finally circling back to the east after reaching Arizona near the north rim of the Grand Canyon. They returned to Santa Fe having never entered California or the areas near the city of Escalante. In 1866, Captain James Andrus led members of the Southern Utah militia through the Escalante area during the Black Hawk Indian War. The valley east of the Escalante Mountains, where the city of Escalante is located, was named Potato Valley since the group had found wild potatoes growing there. Settlers from Panguitch first visited the area in the 1870s, where they met members of the John Wesley Powell expedition. The settlement was named based on a suggestion of Powell's group to honor Escalante even though the expedition had not traveled into the valley. In June 1875, the settlers returned to survey the valley. Twenty acre parcels were staked out for farming while city lots were marked as well. 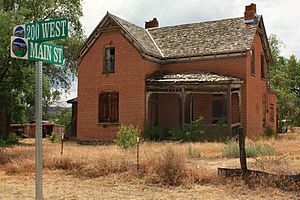 After a winter spent back in Panguitch, the settlers returned again and the first home was built in March 1876 by William Alvey. The first settlers built many homes using native bricks and as a result those homes are still standing to this day. 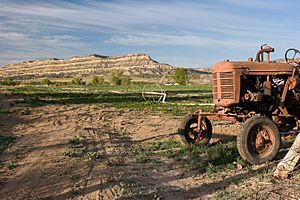 The primary industries of the new settlement of Escalante were cattle and sheep ranching, dairy farming, logging and mining. Farming and ranching continue to drive the local economy today, along with increasing tourist-related activities. In the 1930s, the Civilian Conservation Corps (CCC) built improved roads to Posey Lake and Boulder. Federal government management of large tracts of surrounding lands had begun and stricter regulation of public lands combined with limited private land resources caused many people to leave Escalante in the 1940s. The exodus to look for work in larger communities resulted in a loss of 33% of the population by the 1950 census. The population continued to decline through the next two decades, dropping as low as 638 people, leaving only 15 more people than the very first census in 1880. An increase of 25% by the 1990 census was followed by no change in the 2000 census and a slight decline in the 2010 census. Since the Grand Staircase-Escalante National Monument (GSENM) was established in 1996, Escalante has seen a large increase in the number of tourists, especially in the spring though fall months. A survey taken from March to October 2004 by Utah State University claims that the BLM has estimated 600,000 visitors to various parts of GSENM, many of whom pass through Escalante. 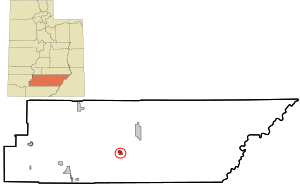 According to the United States Census Bureau, the city has a total area of 2.944 square miles (7.625 km²), none of which is covered with water. Escalante is surrounded by the mountains, cliffs, flats, washes and sandstone canyons of the Grand Staircase-Escalante National Monument (GSENM) and the Dixie National Forest. The city lies within the Potato Valley as designated on the official USGS map. The Escalante River flows from the west passing by the north side of the city and continuing eastward by an area named Big Flat. To the southeast of the city are the Canyons of the Escalante, the eastern part of GSENM, while directly south of the city is the Straight Cliffs formation which runs south-southeast all the way to Lake Powell. The Kaiparowits Plateau, the middle part of GSENM, lies to the south and southwest of the city. To the city's west are the Dixie National Forest and the Escalante Mountains. To the city's north is a small part of GSENM, as well as the Box-Death Hollow Wilderness and the Aquarius Plateau which are parts of the Dixie National Forest. As of the 2010 census, there were 797 people, 334 households, and 217 families residing in the city. The population density was 271 people per square mile (105/km²). There were 420 housing units at an average density of 143 per square mile (55/km²). The racial makeup was 95.4% White, 2.1% American Indian and Alaska Native, 0.5% Asian, 0.1% Black, 0.1% Native Hawaiian, 1.5% from other races, 0.3% from mixed racial ancestry and 3.5% Hispanic or Latino of any race. There were 334 households out of which 22.2% had children under the age of 18 living with them, 57.2% were married couples living together, 4.8% had a female householder with no husband present, 3% had a male householder with no wife present and 35% were non-families. 30.2% of all households were made up of individuals and 12% had someone living alone who was 65 years of age or older. The average household size was 2.39 and the average family size was 3.03. The population was spread out with 22.1% under the age of 18, 8.5% from 18 to 24, 9.7% from 25 to 34, 17.7% from 35 to 49, 24.2% from 50 to 64, and 17.8% who were 65 years of age or older. The median age was 44.9 years. For every 100 females there were 109.2 males. For every 100 females age 18 and over there were 101.6 males. The median yearly income for a household was $38,929 and the median income for a family was $48,654. Males had a median income of $51,223 versus $27,500 for females. The per capita income was $27,648. About 14.5% of families and 14.8% of the population were below the poverty line ($11,490 for a single person household as of 2013) including 2.5% of those under age 18 and 25.3% of those age 65 or over. Escalante has a cold semi-arid (steppe) climate, type "BSk" in the Köppen climate classification system. The semi-arid classification (the "BS") is based on a mean annual precipitation lower than a calculated threshold for potential evapotranspiration. The subtype classification (the "k", signifying cold) is based on a mean annual temperature of less than 64 °F (18 °C). Average yearly precipitation is 10.94 in (278 mm) with most precipitation occurring from July to October with a peak in August of 1.78 in (45 mm). The driest month is June with an average of 0.45 in (11 mm). Snow falls mainly from November to April with trace amounts occurring in October. The average yearly snowfall total is 27.4 in (70 cm). Daytime high to nighttime low temperature ranges are approximately 26 °F (14 °C) in the winter months to 37 °F (20 °C) in midsummer. July has the warmest average high temperatures at 89.0 °F (31.7 °C) while January has the coldest average low temperatures at 14.3 °F (−9.8 °C). The highest recorded temperature from 1901 to 2012 was 104 °F (40 °C) on both July 14 and August 16 of 2002, and the lowest recorded temperature was −22 °F (−30 °C) on January 22, 1937. The current weather forecast is available in the External links section. Escalante, Utah Facts for Kids. Kiddle Encyclopedia.